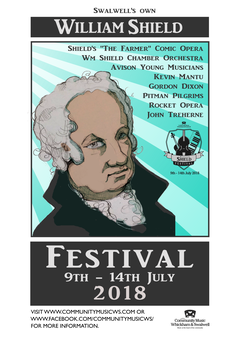 CMWS is proud to announce "Another William Shield Festival", our third annual week long event to celebrate the life and times of this great, but often forgotten, local musician of yesteryear. 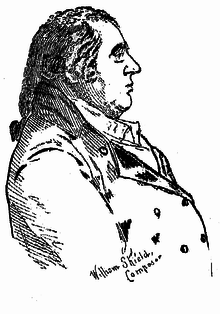 William Shield was born in Swalwell in 1748 and rose to the position of Master of the King's Musick and was principal violinist at the Royal Opera House in Covent Garden. He is buried at Westminster Abbey. Events to celebrate the life and times of this local lad done good will take place in Swalwell (Shield’s birthplace), Whickham and Newcastle upon Tyne. For details of individual events please see our Facebook page. Please come along, there will be something for everyone! Two performances of William Shield's 1787 opera The Farmer, featuring the vocal talents of Rocket Opera backed by the William Shield Chamber Orchestra. Each performance will be in a double-bill with Handel's opera Rinaldo. Musical workshops for children based on the theme of exploring instruments. A cello recital from Gordon Dixon. A recital on the Flentrop organ. Schlusskonzert featuring Avison Young Musicians and CMWS ensembles. Performances will be held at various venues across Tyne & Wear including Whickham, Swalwell, Jesmond, central Newcastle and Gateshead. Who was William Shield Anyway? In 1754, a baby boy named William Shield was born in Swalwell and eventually became famous as England’s leading composer of ballad operas and also as Master of the King’s Music under George IV. A pupil of the illustrious Newcastle Cathedral organist, Charles Avison, William became a virtuoso viola player, toured widely and settled in London, helping to found the Covent Garden Opera House. He made a large amount of money, and was constantly associated with royalty and on his death, willed his favourite viola to King George IV. He was a Founder of the Roast Beef Club and is buried in Westminster Abbey, in the same tomb as Salomon, the virtuoso violinist and orchestral impresario. Amongst many other works, Shield composed a light opera ‘Rosina’ which was set at Gibside and was the smash hit of 1783! The overture contains a melody strikingly similar to that of ‘Auld Lang Syne’, the melody of which is also close to that of a traditional English folk song. All of this has generated a long-term, spirited controversy about the origins of the splendid Scots song. During the Festival, you will have the opportunity to compare the various melodies and draw your own conclusions! You may like to spot the local area’s memorials to Shield: a striking monument in Whickham St Mary’s Churchyard and a modern plaque presented by Gateshead Council in 2009 and displayed near his birthplace at a site in Swalwell. A clue: the site is now a garage. Shield died in 1829 and many local folk do not know much, if anything, of this fantastic talent the area fathered. CMWS wish to rectify this and so you will hear, during the Festival, more intriguing facts of William’s life, his contemporary musicians and the literati of the times. Wow, we are so lucky to have your support - thank you so much everyone!